Feeling blocked? Like an imposter? In need of a confidence boost? Uninspired? Have too many ideas? Unsure of your next steps? Yep x 100. Been there. Feel ya! It’s totally normal and sorry to break it to you, but may not have all the answers overnight. When you do something right, it often needs time. Full confession: my biggest growth didn’t happen alone. It took vulnerability and openness to other ideas that weren’t always comfortable. I still struggle with procrastination and avoidance like many others. But when things really took off for me was when I started investing in myself. Sometimes this was introspectively, other times it was through workshops, classes, or coaches. The more perspectives I gained, the more my super powers grew into a unique combination of tools to draw from. That’s why I wanted to create three packages to help you get you where you want to be. 1 hour conversation. You talk, and I listen. Like really listen. I’ll ask you questions, and do my best to give you the jolt you’ve been looking for. On Skype, Hangouts, phone, or in a café if you happen to be in Paris. When are you free? Shoot me an email, and let’s make this happen! A full day of inspiration, exploration, and wayfinding. 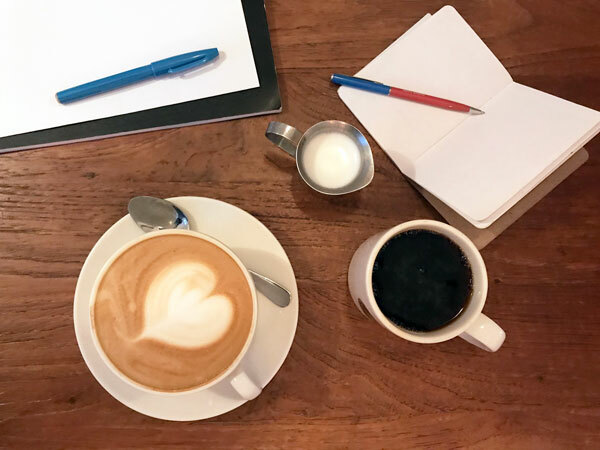 We’ll start the day with a coffee at a Paris café where we’ll talk about your goals, hopes, dreams, strategy, you name it. From there we’ll make a tentative plan to explore Paris (I’ve got this covered). We’ll likely check out a museum, or some shops, but we’ll also just walk and talk, or maybe sit in a park and mindmap. I cater the day according to your interests, and what I think can spark creativity in you. It’s an adventure, and we may re-route throughout the day as new thoughts and ideas come to mind. We’ll spend 6 hours together, then we’ll hop on a 30-min call a few weeks later to check in. You’ll be able to email any questions too. I want to help you get to the next level! To do that, it’s time to step away from the computer. PARIS! Not in Paris, but still want to do this? Let’s talk and see if we can make it happen in another city. How’s tomorrow sound? Kidding, but not really. Don’t put it off. Reach out to me to get something on the calendar. Read more + sample day on Navigate Paris! 6 1-hour calls over 3 months to accompany you on your journey. This option is a deeper look into what can happen on a typical 1- hour consultation. We’re able to weave in more layers and exercises and dig deep. Think of it as a mix of coaching and consulting in one – I’m here to support you however you need it. You’ll have an accountability partner and cheerleader throughout your journey. You’ll also have me on your side via email between calls as well. Perhaps you have one project you want to dig deep on, or maybe you have many ideas you want to toss around over time. Throughout the process, different topics will surely emerge that we’ll explore together as well. All it takes is an open mind. Are you ready to take your work to the next level?!? On Skype / Hangouts / phone, and email. Currently accepting applications. Grab a slot before they’re gone! It starts with a quick email to make sure we’re a good fit. Shoot Anne an email to get started! For more testimonials, check out the page work with me. For Paris-specific offerings, check out Navigate Paris. Embrace the blank page. And the process. Connect the dots and figure out what makes you you. Don’t wait for perfection. Go for progress. * HT = hors tax. Sales tax or the VAT in France is 20%. If you live abroad or have your own business you may be exempt. PSST. Interested in working with me, but it’s not in your budget? This doesn’t mean you don’t have the money because you just blew your paycheck on an expensive new bag. It means you work hard and are trying to get ahead, but it everything feels like a struggle still. If you’re a student or from an under-represented group, please reach out to me. I offer a few scholarships or discounts every year to those who show drive and promise, but may need an extra hand.